Watch the NEW "Coke Commercial Spec" Directed by Nick Martin. 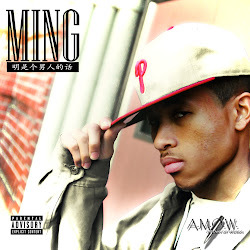 Producers DuNo Tran & Steven Lam of (DSP) & Starring Artis, Ming, Y.J Gold and More! Synopsis: An older gentleman tries to exercise at a local park and gets discouraged that he's physically past his prime. However, with the assistance of Coke, he re-energizes his life! Music: Shin-B - "Gotta Move, Gotta Groove"
Get ready for the most exciting spring event Bergen has ever seen. 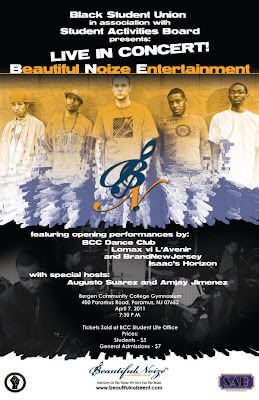 For the first time ever, Bergen Community College is hosting a student produced concert and it truly has been long awaited. 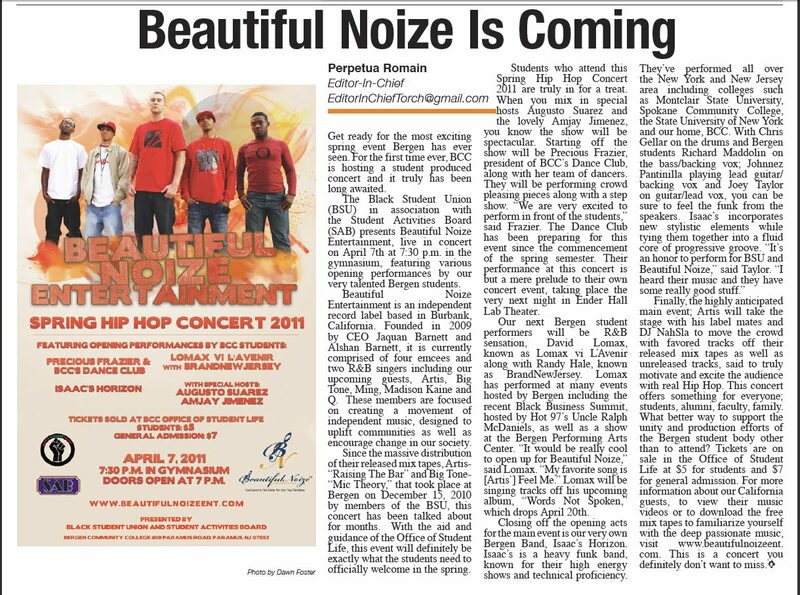 The Black Student Union (BSU) in association with the Student Activities Board (SAB) presents Beautiful Noize Entertainment, live in concert on April 7th at 7:30 p.m. in the gymnasium, featuring various opening performances by our very talented Bergen students. Beautiful Noize Entertainment is an independent record label based in Burbank, California. Founded in 2009 by CEO Jaquan Barnett and Alshan Barnett, it is currently comprised of four emcees and two R&B singers including our upcoming guests, Artis, Big Tone, Ming, Madison Kaine and Q. These members are focused on creating a movement of independent music, designed to uplift communities as well as encourage change in our society. 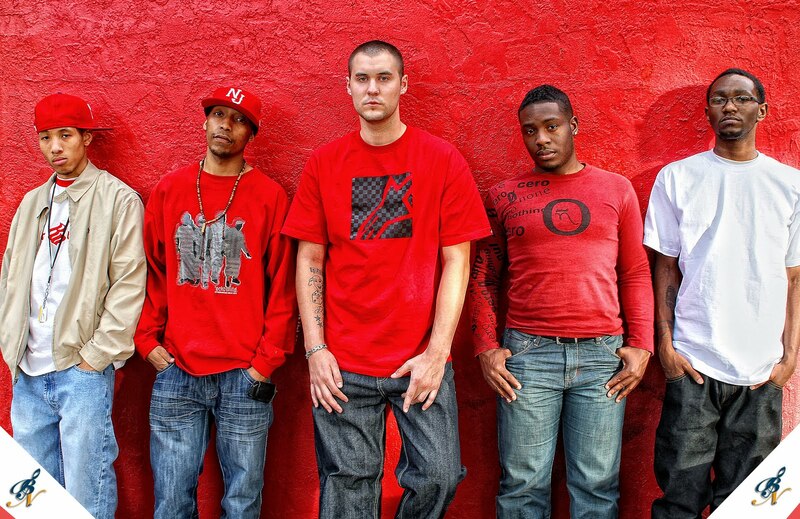 Since the massive distribution of their released mix tapes, Artis- “Raising The Bar” and Big Tone- “Mic Theory,” that took place at Bergen on December 15, 2010 by members of the BSU, this concert has been talked about for months. With the aid and guidance of the Office of Student Life, this event will definitely be exactly what the students need to officially welcome in the spring. 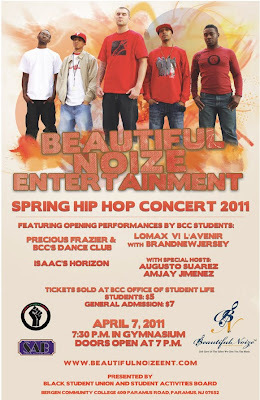 Students who attend this Spring Hip Hop Concert 2011 are truly in for a treat. When you mix in special hosts Augusto Suarez and the lovely Amjay Jimenez, you know the show will be spectacular. Starting off the show will be Precious Frazier, president of BCC’s Dance Club, along with her team of dancers. They will be performing crowd pleasing pieces along with a step show. “We are very excited to perform in front of the students,” said Frazier. The Dance Club has been preparing for this event since the commencement of the spring semester. Their performance at this concert is but a mere prelude to their own concert event, taking place the very next night in Ender Hall Lab Theater. Our next Bergen student performers will be R&B sensation, David Lomax, known as Lomax vi L’Avenir along with Randy Hale, known as BrandNewJersey. Lomax has performed at many events hosted by Bergen including the recent Black Business Summit, hosted by Hot 97’s Uncle Ralph McDaniels, as well as a show at the Bergen Performing Arts Center. 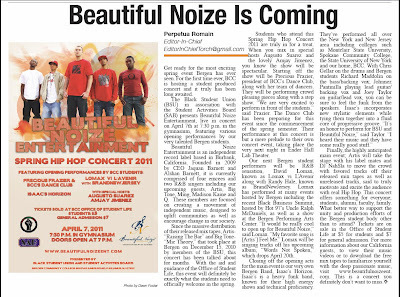 “It would be really cool to open up for Beautiful Noize,” said Lomax. “My favorite song is [Artis’] Feel Me.” Lomax will be singing tracks off his upcoming album, “Words Not Spoken,” which drops April 20th. 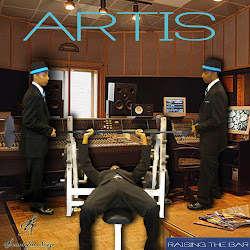 Finally, the highly anticipated main event; Artis will take the stage with his label mates and DJ NahSla to move the crowd with favored tracks off their released mix tapes as well as unreleased tracks, said to truly motivate and excite the audience with real Hip Hop. This concert offers something for everyone; students, alumni, faculty, family. What better way to support the unity and production efforts of the Bergen student body other than to attend? Tickets are on sale in the Office of Student Life at $5 for students and $7 for general admission. 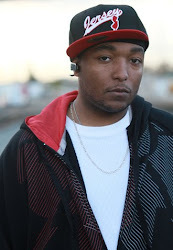 For more information about our California guests, to view their music videos or to download the free mix tapes to familiarize yourself with the deep passionate music, visit www.beautifulnoizeent.com. This is a concert you definitely don’t want to miss. This is a March 2011 issue. Photo by Dawn Foster and please visit www.torchbcc.com for more info. Watch Before the Fame Episode 16 where each Beautiful Noize Entertainment artist as Artis, Big Tone, Madison Kaine, Ming and Q travel together to Arizona to meet up with the one and only Lady Maverick! We hold her down in our BNE fam because she represents the true definition of a female emcee/artist that is purely multi-talented in singing, rapping and dancing! Much respect to LM always! We are currently in collaborations working on something big, so we did some recording in AZ, photo shoots, bonded so much more and had a great night out enjoying our leisure time as artists. History was made as everyone finally united together and continue to follow us on our journey towards success. #BeforeTheFame, sorry for the Hiatus for all those that have been waiting/supporting us, we have been busy working hard for you all and our episodes are back (BNE). Paramus, NJ: The Black Student Union (BSU) at Bergen Community College (BCC) welcomes Beautiful Noize Entertainment (BNE) to headline their upcoming Spring Concert on Thursday April 7th, 2011 at 7:30pm in the Bergen Community College Gymnasium. The Spring Concert is presented by BSU, will be sponsored by the Student Activities Board (SAB) and will feature performances by all the BNE members as Artis, Big Tone, Madison Kaine, Ming, Q. Notable selections from “Artis’s Raising the Bar, Big Tone’s Mic Theory” and newly unreleased material as well will be performed for those in attendance. The concert will also feature performances by “Isaac’s Horizon,” a heavy funk band based in Bergen County, NJ known for their high energy shows and technical proficiency, Dance Club performances and other opening acts of talent. The evening will be filled with a great night of entertainment as all the performers showcase their talents on stage and if you are in the Tri-State area on April 7th, 2011 be sure to come out and witness all the Beautiful Noize Entertainment members live in action delivering an entertaining, exciting and memorable performance. If you are a fan of Hip-Hop, R&B, or simply a fan of music, this is a night you don’t want to miss! Expect to hear conscious lyrics and passionate music that you can dance to as well as become inspired and understand why BNE truly stands out and remains distinctively incomparable to what the general public is used to hearing via commercial radio. Please mark your calendars and stay updated on all announcements as tickets will go on sale soon. When: Thursday, April 7th at 7:30 p.m.
How: Tickets can be purchased at the Door and purchased at the College Office of Student Life, Pitkin Education Center #A-115 Office Hours Mon-Fri 9:00 AM - 5:00 PM Phone (201) 447-7215, subject to availability.